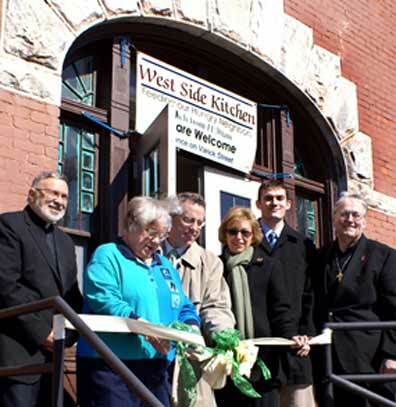 UTICA, Nov. 20, 2009 -- Mother Marianne's West Side Kitchen received $1,000 in gift cards from Hannaford Supermarkets Nov. 19 to help feed the hungry this holiday season. During a ceremony at the soup kitchen in St. Joseph-St. Patrick Parish Center, Hannaford distributed a total of $15,000 -- $1,000 each to 15 agencies -- to help combat hunger in the greater Utica area, noted Cheryl Rondenelli, manager of Hannford's Clinton store. 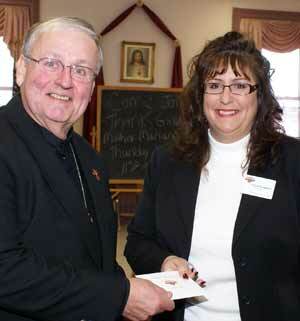 Deacon Gil receives donation from Cheryl Rondenelli, manager of Hannaford's Clinton store. Deacon Gil Nadeau, soup kitchen director, thanked Hannaford for the "generous donation" and said he and the volunteers were delighted to host the event. Tara Morgan, regional community relations specialist for Hannaford, said they chose the soup kitchen to meet with the news media and distribute the donations because "at the end of the day, this is where the food goes" and illustrates best "what we're doing, which is feeding people." 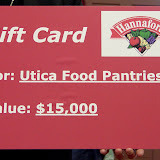 The other agencies receiving Hannaford gift cards are: Food Bank of Central New York, Community Food Bank of Greater Utica, Hope House, Johnson Park Center Food Pantry, Rescue Mission of Utica, Salvation Army of Utica, Seeds of Hope Food Pantry, St. John's Outreach, St. Margaret's Food Pantry, Thea Bowman House, Utica SDA Church Food Pantry, Westminister Presbyterian Food Pantry, YEP Food Pantry and YWCA Hall House Food Pantry. Rondenelli said the second phase of Hannaford's effort to fight hunger would begin later this month. From Nov. 29 to Dec. 26, customers at the checkout register will be able to make cash donations to local food pantries, and also beginning Nov. 29, Hannaford will offer a "buy one, give one" option. When shoppers purchase specially marked Hannaford brand soup, cereal and pasta items, the store will donate the same number of items to area food agencies. Representatives of 15 agencies pose for photo with Hannaford officials.